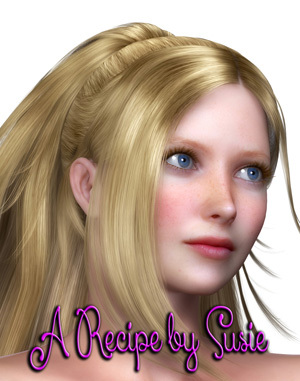 Susie Vasilly from Familiar worked at Millie’s diner where Slade Spencer liked to eat, and she knows a lot of good recipes. One of them is a wonderful bbq dish that is great for summer, and we all know how much I love to grill so this is one of my favorites. Susie will tell you all about it. Susie: You know, Elizabeth, this is one of my favorite recipes too. Actually, anything that isn’t tuna is high at the top of my list after having to eat it in my cat form for so many years. And Slade likes anything I make him, so he is really easy to please. 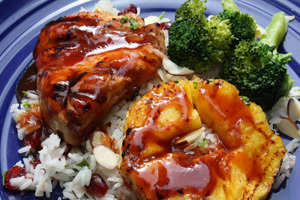 It’s called BBQ Pineapple Chicken and I like to serve it with a simple blanched veggie like broccoli, and a side of jasmine rice. Here’s how to make it. Start out with two chicken breasts cut in half. Put them in a covered dish with a marinade on them in the fridge for a couple of hours. 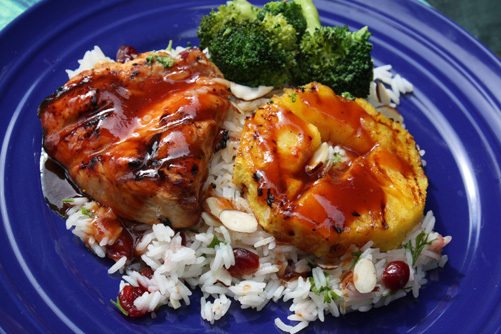 Marinade: 2 tsp teriyaki sauce, 2 tsp bbq sauce, a squeeze of lime, a sprinkle of salt and pepper and squeeze the rinds of a fresh pineapple over it too. While that is marinading, cook 2 cups of jasmine rice in 3 cups of water and throw in a handful of dried cranberries and slivered almonds. Cover and simmer til liquid disappears. When it is almost done, throw in some fresh chopped parsley. And blanch a veggie such as broccoli to go with it. As for the chicken, put it on a low grill and cook about ten minutes a side or until done. Take a whole fresh pineapple, and cut off the rinds (squeezed in the marinade earlier) and core it. Slice it into rings and sprinkle with paprika or if you like spice, some cayenne. Grill the pineapple, flipping once. You don’t need long, just watch for it to get grill marks and soften up a little.